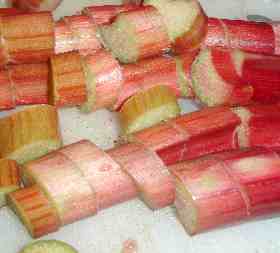 How to make the world's best rhubarb-strawberry pie! EASY and illustrated instructions! Want to make the best rhubarb-strawberry pie you've ever had, and don't want to spend all day in the kitchen studying overly-complicated recipes? 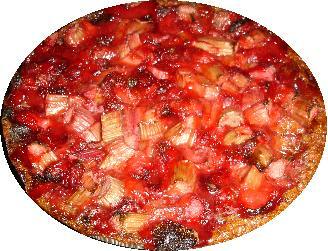 This rhubarb-strawberry pie is easy and tastes amazing. 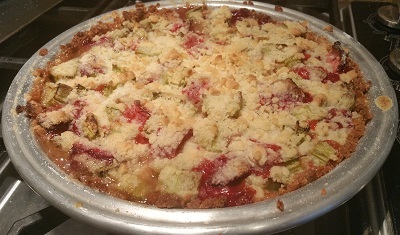 If you've never had a rhubarb strawberry pie, you really have no idea what you are missing! And it doesn't matter if you're not a chef or have never made a pie before! 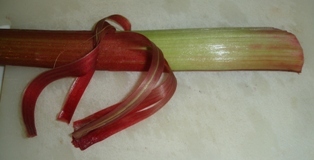 Following these illustrated directions ANYONE can cook a perfect rhubarb-strawberry pie for any occasion! This recipe has been improved for 2016, so it's even better! 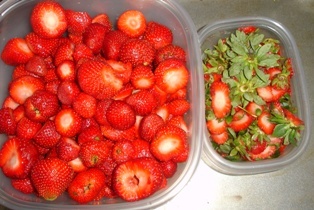 3 cups prepared strawberries (a 1 lb countainer of fresh strawberries is about 2 cups after removing hulls) Note you can easily do 4 cups of rhubarb and 2 cups of strawberries or vice versa, but I like it 50-50.
for those on sugar-restricted diets: 3/4 cup sugar and 3/4 cup Stevia (in a prepared form like Truvia, it measures same as sugar; if you use another form, you'll need do your own conversion) - or Splenda, if you prefer, works in pie recipes, but not by itself. The pie turns out heavy and with much less flavor; you can do it, if you must, but the results aren't as good). 1 teaspoon grated orange zest (fresh or dried) Just rub an orange against a fine cheese grater, to remove the thin outer layer of the peel. Or just buy the dried grate orange peel at the grocery store. Most people seem to prefer with the crumb topping. It gives it a nice crunch on top which balances the soft, sweet filling. 1/4 cup cold butter or margarine. Do not melt the butter, just dice it into the sugar and flour as you mix them together. 9 inch pie graham cracker crust (grocery stores sell both disposable pie pans and glass pans. Get the deep dish type! If you'd rather make your own (they are MUCH better home made) then see this page about how to make a graham cracker pie crust). 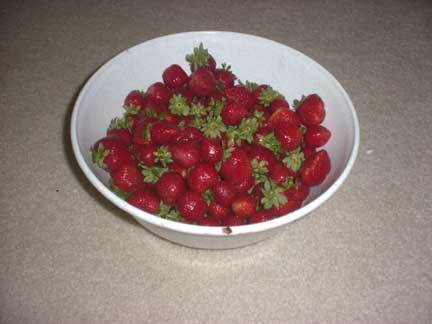 Combine the sugar, corn starch, vanilla extract and grated orange zest / peel in a bowl. Never made a graham cracker pie crust either? Fear not, they are really simple. 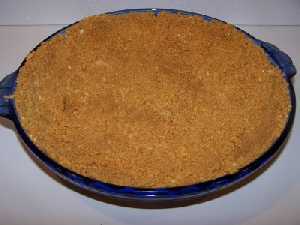 Click here for instructions about making a graham cracker pie crust. 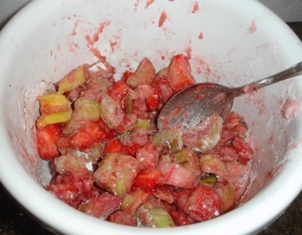 It will open in a new window, so just close the new window to return here. .
That's it: take the mixture of rhubarb, strawberries, sugar, corn starch, etc from step 4 and just pour it into the pie. Side this aside while you make the crumb topping and get the oven heating up. .
- 1/4 cup cold butter or margarine. Do not melt the butter, just dice it into the sugar and flour as you mix them together. 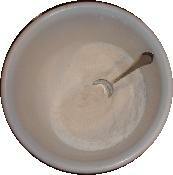 in a small bowl and sprinkle it over the pie. 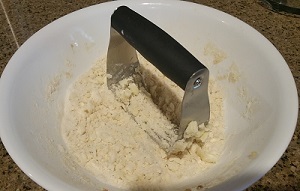 The dough dicer/blender, shown above in the Amazon box, is ideal for making a perfect crumb topping. A fork or potato masher is your next best bet. Sprinkle the crumb topping evenly obver the top of the pie. Step 8 - Put the pie in the oven! Bake the pie at 425 F for 15 minutes, then turn the heat down and bake at 375 F for another 30 minutes. Let it cool to room temp then refrigerate to allow it to firm up! Or eat it warm with vanilla ice cream!